Borscht conspiracy. More of Zapiro’s brilliant work available at www.zapiro.com. 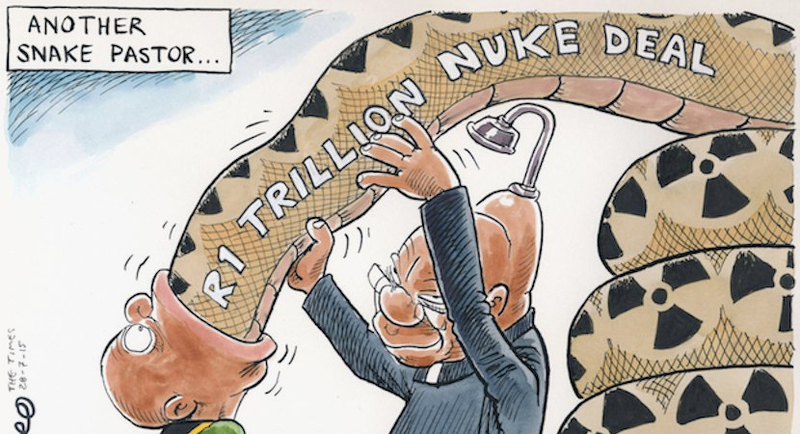 Under the presidency of Jacob Zuma, South Africa has been trying to implement a massive new nuclear programme. The initiative stood against a growing body of evidence pointing to the fact that nuclear isn’t needed, is too costly and is hard to finance. There is also the fact that the case for renewables looks increasingly favourable than nuclear. And last year, civil society groups secured a court order that halted the nuclear build programme temporarily on grounds that government had not followed due consultative process. But Zuma has insisted on the nuclear programme, going so far as to appoint a minister to the energy portfolio who continues to argue that the country needs nuclear energy. But the facts are still against him, as they were against the previous four ministers who failed to deliver Zuma’s nuclear project. South Africa has surplus energy capacity. Along with new capacity that is coming online, the country does not need nuclear power to meet electricity demand for many years, despite the scheduled closure of some old coal plants. In fact, demand has fallen in South Africa and is lower than it was a decade ago. At the same time, renewable energy prices have plummeted globally and rival or even undercut the operating costs of many existing nuclear or fossil-fuelled power stations. Within just one year (2016), world costs for new onshore windpower fell by 18%, for offshore wind by 28%, and for utility-scale photovoltaics (PV) by 17%, while low bids fell 37% for Mexican PV and 43% for EU offshore wind. In South Africa, transparent auctions have already cut solar PV electricity prices by close to 80% and wind energy by nearly 50%. Government’s nuclear policy consistently cites as its analytic basis the Integrated Resource Plan (IRP) for Electricity 2010 to 2030, formally published in May 2011 and updated several times since then. But over this time, the economic rationale for nuclear, never particularly strong, has weakened considerably. So much so that nuclear energy is not picked in any South African modelling scenarios, other than one where artificial constraints are placed on how much solar and wind energy can be built and where additional carbon budget limits are imposed. Even in this extreme scenario, nuclear energy might only be required after 2039. Instead, the models favour solar and wind plus gas as the cheapest option for sustainable electricity supply. Renewables also perform well on the question of reliability. A recent engineering study confirms that the South African power system will be sufficiently flexible to handle very large amounts of wind and solar power generation to cope with increased flexibility requirements. Global nuclear enterprise is slowly dying from an incurable attack of market forces. Financial distress stalks vendors, with cascading insolvencies spreading in the past two years. Construction cost and delays keep rising worldwide. 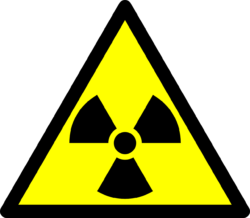 The global nuclear industry continues to suffer major risks of project failure or abandonment. For example, of 259 US nuclear units ordered between 1955-2016, 128 (49%) were abandoned before start-up and 34 (13%) prematurely closed later. Of the 97 units (37%) operating in mid-2017, 49 were deemed uneconomic to run; 35 suffered 45 year-plus safety-related outages. And only 28 units (11%) remain economically viable. By contrast, renewable energy is dominating new investment in power generation worldwide. Bloomberg New Energy Finance estimates renewable energy will capture 72% of global power generation investment by 2040 as costs drop by a further 66% for solar power, 47% for onshore wind, and 71% for inshore wind plants. China has generated more wind power than nuclear electricity since 2012. India has quadrupled its renewables target and is planning 100 GW of solar power (now cheaper than coal power) by 2022. Over three billion people now get more non-hydro renewable than nuclear electricity, in three of the world’s four top economies (China, Germany, Japan) and in Brazil, India, Mexico, Holland, Spain, and the United Kingdom. Renewable energy projects also aid development in previously marginalised and disadvantaged groups and communities. Thanks to novel economic development criteria built into South Africa’s world-recognised renewable energy independent power producer programme. Black South Africans own, on average, 31% of projects that have reached completion. Black local communities further own on average 11% of the equity of projects. The above facts demonstrate that nuclear lacks a business case for South Africa, whichever country provides the technology. 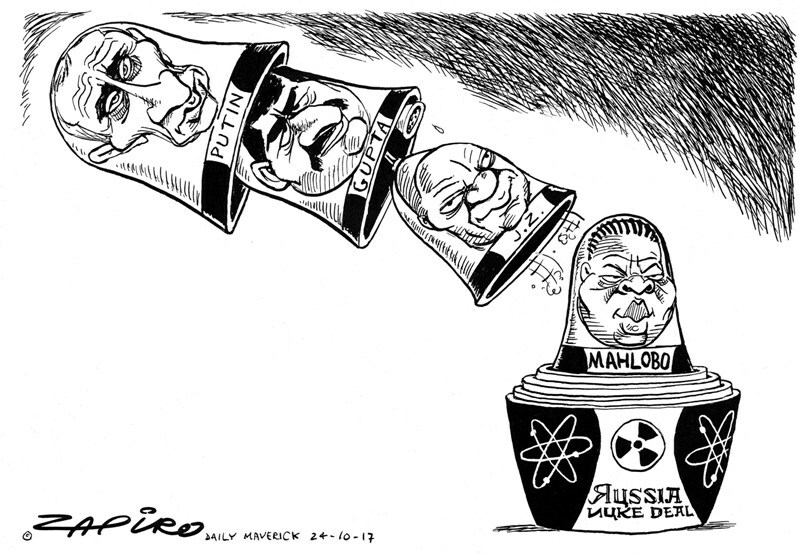 But there is special cause for concern about South Africa’s proposed nuclear deal with Russia. 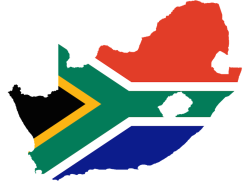 During a series of private presidential meetings over the past seven years, South Africa concluded an unusually strong and specific nuclear agreement with Russia, since struck down by the courts. 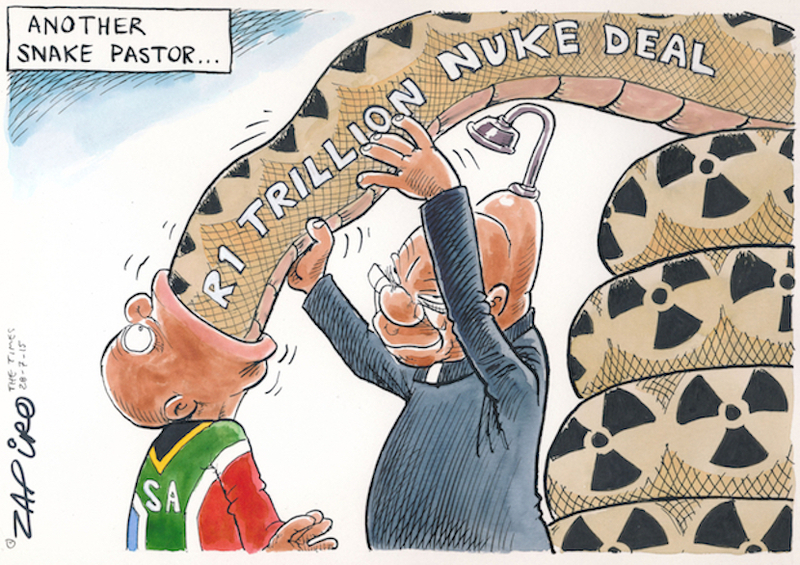 Zapiro clearly has strong views on Jacob Zuma’s desire to land taxpayers with a $100bn nuclear power fleet. More of his magic at www.zapiro.com. Additionally, Russia is facing economic challenges, sliding in terms of rated world economies to number 15, below Mexico. Sovereign debt is a real concern and low oil prices and Western sanctions in response to Russia’s aggression towards the Ukraine and other areas are making matters worse. Russia wants to build nuclear power plants but needs huge amounts of capital to finance its nuclear commitments around the world. It hardly appears to be a stable financial partner. South Africans deserve reliable and affordable electrical services. At issue is how much money, time, and opportunity for national advancement will be lost before the country finally abandons the folly of procuring new nuclear power plants. Amory Lovins, chief scientist at Rocky Mountain Institute, coauthored this article. Anton Eberhard, Professor at the Graduate School of Business, University of Cape Town. This article was originally published on The Conversation. Read the original article.